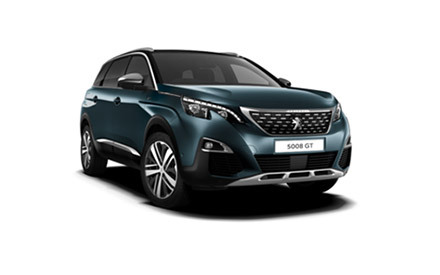 There are so many reasons why you should be considering the new Peugeot 5008 SUV GT your next set of wheels if you’re looking for a stylish family car. Available to order here at Motorparks, the new 5008 SUV GT has a spacious cabin that can accommodate seven people comfortably. The interior is also packed with state-of-the-art technology, which includes an eight-inch capacitive touchscreen dashboard and a 12.3-inch head-up digital instrument panel that is housed neatly behind the car’s multifunction steering wheel. We mustn’t forget to mention how amazing each of our new Peugeot 5008 SUV GT cars look from the outside, with chrome door mirrors, 19-inch ‘Boston’ diamond cut alloy wheels, Peugeot’s signature ‘Claw Effect’ LED rear lights and a sports-inspired chequered grille complete with a full LED headlight array all vying for your attention. Find the new 5008 SUV GT that’s perfect for your requirements from the selection below and make an enquiry online now. For even more choice, have you also checked out our collections of new 5008 SUV, 5008 SUV GT Line and 5008 SUV GT Line Premium cars?